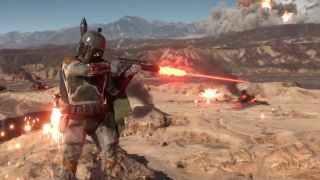 EA has announced the Star Wars Battlefront beta is set to begin October 8, but will only last up until the end October 12. The beta, which is more of a technical test for game-maker DICE, will be available on PC, PlayStation 4 and Xbox One, and will be open to everyone. The announcement of the beta also sheds some light on what we can expect from the game when it launches officially on November 17, with the beta to focus on three modes on three different planets. You'll be able to check out the 40-player battles of the Walker Assault on Hoth, which we have seen in trailers before, as well as the Drop Zone Sullust, which features 8v8 matches. There's also the online and offline split-screen co-op Survival Mission on Tatooine, which will have you facing hordes of Imperial forces - something we've also seen glimpses of in previous trailers. Along with the game beta, players will also be able to test out the Star Wars Battlefront Companion app, which includes the Star Card perk system, but during the beta, you'll only be able to access it via the web.